I love dressing up for Halloween. Always have. I think it's so much fun. It's the only holiday that I really have trouble with Hubby's job because it's non-transferable. You kinda get one shot with Halloween. I always love dressing up for Halloween and even dressed up (kind of) in China. Last night Hubby worked and Reese slept and I watched Hocus Pocus. Around 9pm my sister called me to see if she could stop by to make me totally jealous show me her Halloween Costume. 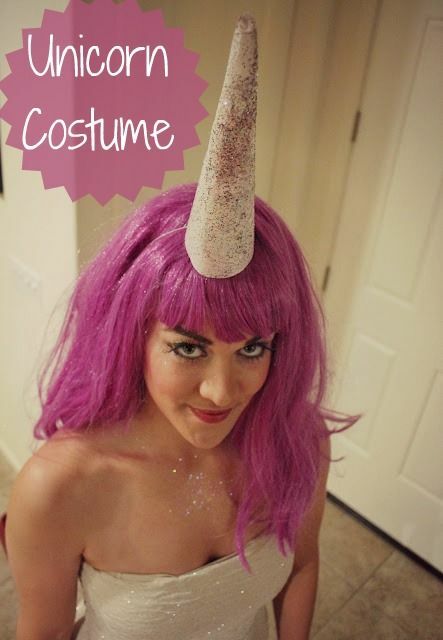 She was a Unicorn and it was so awesome! 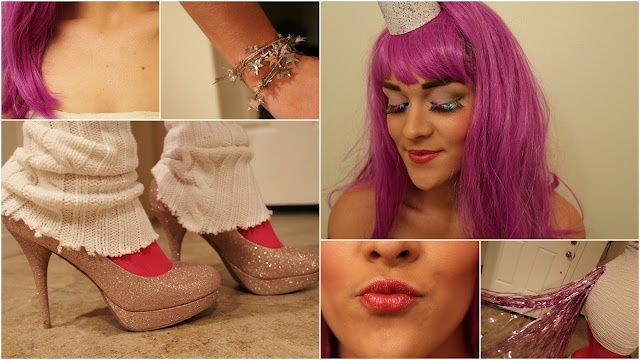 So, I was totally jealous when my sister came over looking so fabulous for a party this year. She made most of the costume, which is economical and awesome. And she looked so darn cute! She wore a sparkly dress that she already owned, but you can find a similar dress HERE or HERE. 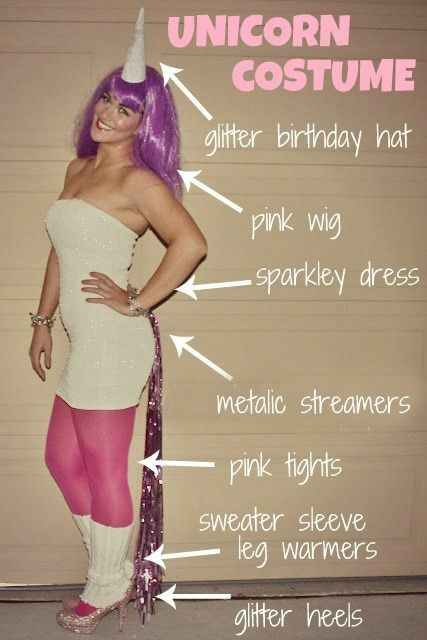 She added some bright tights, glitter pumps, painted a birthday hat for a horn, wore a fun wig, wrapped star garland around her wrist, put on rainbow eyelashes and doused herself in glitter. For a tail, she cut a hole in her dress and ziptied a metallic-door-decoration-streamer thingy. 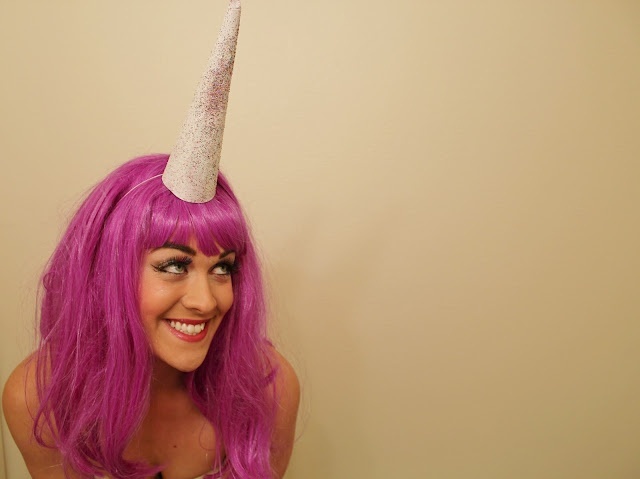 But I gotta say, probably my favorite part of her costume besides the Katy Perry wig were here unicorn leg-warmers. She just cut of the arms of an old sweater. You could totally continue to wear this as leg warmers over heels or pull them up and where them at the top of your boots. Make your own leg warmers for the win! Hubby and I are planning on dressing up with Reese tomorrow for sure and will take pictures. We have a whole themed family costume planned! I just loved this costume and wanted to share it with all y'all! Have fun tomorrow and be safe out there! Juno! Ha ha that great! Your sister looks pretty dang amazing and that is one of the most creative costumes I've seen in a while! :) Hope you had a great weekend! What a cute idea!! I love the wig and tail- she looks fab! her unicorn outfit is so absolutely fabulous, but hey, watching hocus pocus is just as cool! p.s. you make a fabulous lady gaga girl!! Love, Love the unicorn! So creative--thanks for linking up! Okay how did I not see this post until now?? Girl - I am dying! :) And I SO want to do this. Love! Just now saw this. I love it! Do you know where your sister got the long metallic streamers?